Hi my name is Paris! 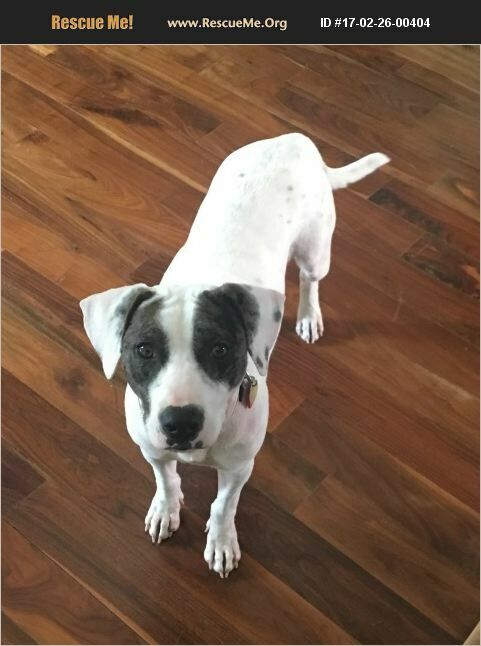 I am a gorgeously marked mostly white-with-black-eye-patches Catahoula/ Pointer/ Pit mix female who weighs 40 pounds and who was born about May 2015. I'm a very energetic 'teenager' who loves to go to the park and play with other medium-sized dogs. (I don't do well with small yappy dogs, however.) I especially love my rope toy! I especially love my rope toy! I'm living proof that even gals of rare breed mixes and with unique colorations can end up in big trouble! I was found foraging for food as a lone stray in a park and then was turned into a shelter. It was my lucky day when my future foster mom saw me and rescued me because I didn't like that place! As much as I love my foster home, I would love a home of my very own. If it were an active home with lots going on, that would be terrific. I'd do great with older kids but, since I still jump a bit, I might knock over a small child by mistake. I live in a foster home with cats, but my foster mom says that I'm 'marginal' but not impossible with cats; I just need more training, and right now she wouldn't leave me alone with the cats. I'm crate trained, so now all I need is my forever home! Arrange to meet me today and help me start the next -- this time happy -- chapter in my life! Paris is updated on shots, spayed, dewormed, microchipped, and heartworm tested. Her adoption fee is $150, cash or check payable to Buster's Friends. Please click the contact button if you are interested in Paris, and we can arrange for you to meet her. To make the process more efficient, download the adoption application at http://www.bustersfriends.org/dogadoptionapplication.shtml. First save and then open it; then you can print it and fill it out.